And so we come to the inevitable (if not enviable) smoothie entry. The peanut-butter-and-jelly smoothie came in at Numero 7 on – say it with me – 29 Ways to Honor the Glory of Peanut Butter and Jelly. The original recipe came from Becky Bakes (good thing for me that she also makes smoothies). You will have extra strawberry creme. I hope this will not prove to be an inconvenience for you. Sharing this smoothie goodness on Healthy Vegan Friday on The Veggie Nook. Drink your PB & J with this cool and creamy vegan smoothie that’s topped with a rich and luscious strawberry creme. In a food processor, process the strawberries until finely chopped. You’ll have to scrape the sides down several times. Add a tiny bit of water if necessary. Add the remaining ingredients and process until very smooth. Put mixture into the refrigerator while you prepare the smoothies. Add all of the smoothie ingredients to the blender and process until thick and smooth. Divide between two glasses and top with the strawberry creme. *Don’t happen to have Chocolate PB2 powder in your pantry? Just use peanut butter to taste and one tablespoon of cocoa powder. Peanut butter in a smoothie? I would never have thought of that, and your strawberry creme looks absolutely wonderful. Haha! It is rather pretty, isn’t it? Very happy that I had “leftovers” of it! Peanut butter smoothies are my favorite! This part cracked me up: “You will have extra strawberry creme. I hope this will not prove to be an inconvenience for you.” I feel fairly confident I’ll be able to power through with the extra strawberry creme. I’m brave like that. A divine smoothy, I say! I say: Yummmmm! That added topped strawberry coconut cream looks so luscious too! Keep the tasty recipes coming, Anne! I’m trying :-)! Still a long way to go! You’re kinda right on that :-)! 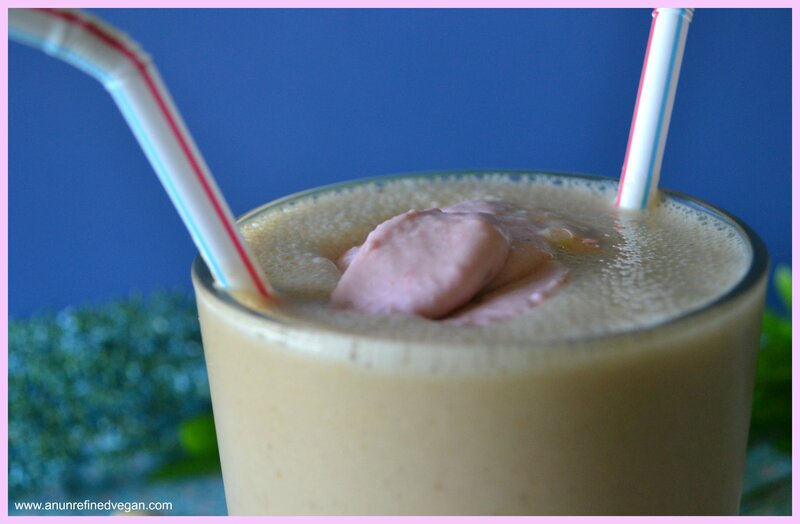 there are few things that rival a good punch of peanut butter in a smoothie! And chocolate and strawberry?!? well that’s certainly a win for me! 🙂 It’s like best friends or something! Holy smokes!! Thanks so much, Poppy! I’m honored to be a part of the family! Leftover strawberry cream?? Oh nooooooo! I’ve tried Peanut Butter and Banana smoothies and thought they were too thick and sweet but this one has great potential…maybe you should change the Unrefined Vegan to just a peanut butter blog 😉 Great stuff here! I know exactly what you mean, Angela. I also have that issue when blueberries are the predominant ingredient. Oh, woe is me, right ;-)? I certainly feel like An Unrefined Peanut Butter Vegan! Um, yeah, the leftover strawberry cream would NOT be an inconvenience! I think I could eat that by the spoonful. Love adding peanut butter to smoothies. You are rocking MoFo Annie! I did in fact eat the strawberry creme with a spoon :-)! You probably could :-)! But I suggest trying a little bit of oats (if you can eat them) or hemp seeds.